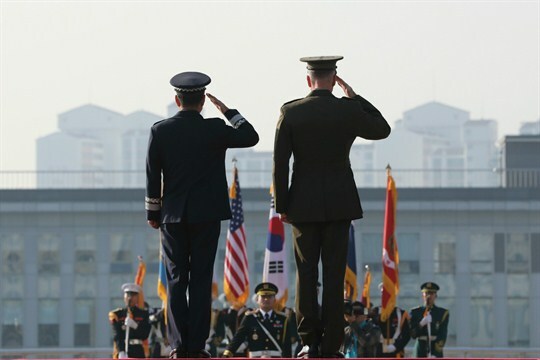 Gen. Joseph Dunford, right, chairman of the U.S. Joint Chiefs of Staff, and Gen. Jeong Kyeong-doo, his South Korean counterpart, salute during an honor guard ceremony, Seoul, South Korea, Oct. 27, 2017 (AP photo by Lee Jin-man). It is the world’s most successful, most powerful and most popular security alliance. Considering the number of countries waiting to get in, the North Atlantic Treaty Organization seems to have even more admirers than it can handle. But it also has an unexpectedly prominent and powerful critic: the president of the United States.